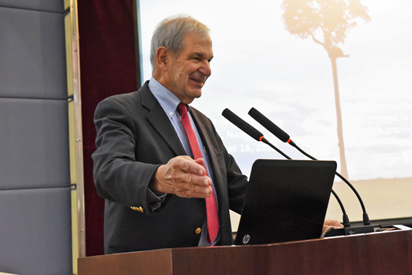 We are very pleased to announce the appointment of Prof. James M. Tiedje as an Honorary Editor-in-Chief of Pedosphere, following his appointment as an Honorary Professor of Institute of Soil Science, CAS in 2016. 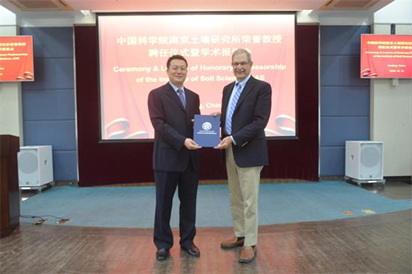 Prof. James M. Tiedje was awarded the certificate for Honorary Editor-in-Chief of Pedosphere by Professor Xiaoyuan Yan, Deputy Director of Institute of Soil Science, CAS, on behalf of Professor Ren Fang Shen, Director of Institute of Soil Science, CAS, President of Soil Science Society of China, and Editor-in-Chief of Pedosphere, in the appointment ceremony, followed by academic speech by Prof. Tiedje and Prof. Hui Li from Michigan State University, USA, in November 16, 2018. Prof. Tiedje is University Distinguished Professor of Microbiology and Molecular Genetics, and of Plant, Soil and Microbial Sciences, and is Director of the Center for Microbial Ecology at Michigan State University. He was President of the American Society for Microbiology and the International Society for Microbial Ecology. He became Fellow of The American Association for the Advancement of Science in 1985, shared the 1992 Finley Prize from UNESCO for research contributions in microbiology of international significance, and awarded as an academician of the American Academy of Sciences in 2003. He was appointed an Editor-in-Chief of Applied and Environmental Microbiology and an editor of Microbial and Molecular Biology Reviews. Prof. Tiedje focused on microbial ecology, physiology, and diversity as well as biodegradation of pollutants and resistance genes of antibiotics. Recently, he and his group seeks to understand the genetics/genomics underlying important microbial processes in nature. He has over 550 refereed publications including 22 in Science, Nature, and PNAS. His publications have been cited more than 93800 times, with a high H index of 150. 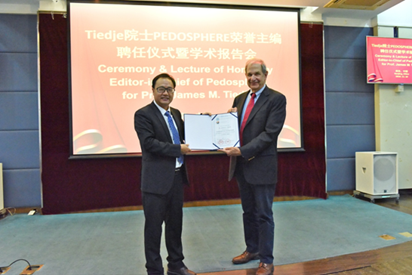 Pedosphere—A peer-reviewed international journal—was founded in 1991. The 2017 impact factor of this journal is 2.430 and ranks the 12th out of the 34 journals (Q2) in the category of soil science around the world.